Parks are more than just playgrounds. This report, from APA's Planning Advisory Service, shows you how to plan for parks that protect wildlife, help manage stormwater, and allow residents to connect with nature. 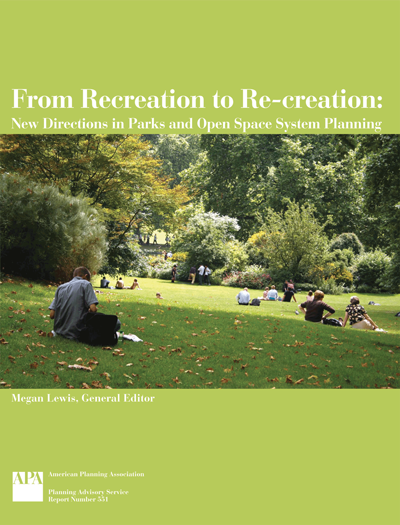 To create truly successful park systems, park planning needs to incorporate the needs of all stakeholders into the process — in essence, bring together the broad, inclusive approach of comprehensive planning and the natural system mindset of environmental planning in a new approach to park system planning. This new approach can be viewed as a move away from primarily “recreation” to the idea of “re-creation,” or creating places that allows individuals to “re-create” themselves and their relationship to nature.